Taking a bar crawl in Las Vegas gives you a chance to explore all the different establishments and experience the unique culture that thrives in the area. With Vegas Pub Crawler, you get the added bonus of traveling through the streets of DTLV in style on our 15 person pubcycle. Because we handle all the transportation for the evening, everyone in the group will be able to enjoy some delicious, handcrafted cocktails unique to the Downtown area. While we’re confident that you will find plenty perfect drinks at each bar crawl stop, we have a few that you have to try. Okay, so this first one is not technically a cocktail, but it is a unique experience that we feel should make the list. Nacho Daddy is the place to go if you feel in the mood for the perfect margarita. With over 60 selections to choose from, you just can’t go wrong. We have also found that Nacho Daddy is the perfect place to find out who is the bravest one in the group through the famous scorpion shot. You will have the opportunity to take a shot of tequila with an actual scorpion floating around inside the glass. 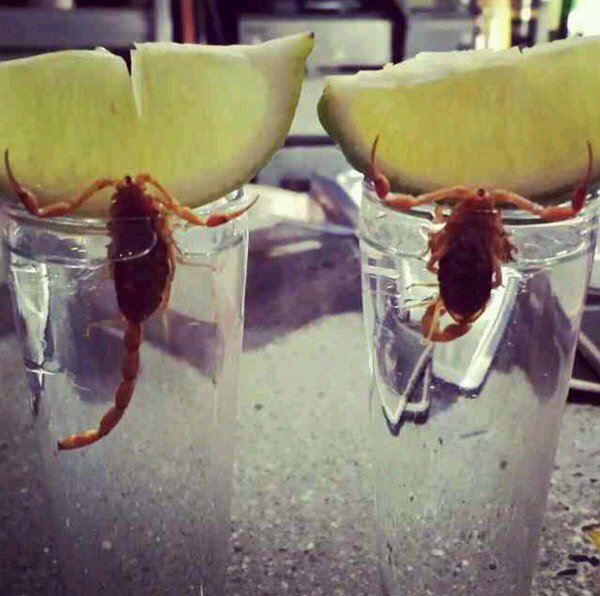 Don’t worry though, the scorpion is dead and you get a lime to chase the shot. The holidays may not be here for a while but who says you can’t achieve the holiday spirit through your spirits (see what we did there?). Park on Fremont has a great selection of handcrafted cocktails and delicious bites, and one at the top of the list is their Dirty Girl Scout cocktail. Made with peppermint schnapps, dark créme de cacao, hot chocolate, topped with whip cream and a chocolate stick, you will get that warm holiday feeling in you after you take one sip of this drink. The Moscow Mule has grown in popularity over the years, and you can find one in many different establishments. If you head into The Griffin, you can get a twist on a delicious cocktail. Made with a few simple ingredients: vodka, soda, lime and simple syrup, The Griffin decided to twist things up by using Jameson whiskey instead of the vodka. It adds a refreshing twist to a classic cocktail. Atomic Liquors is one of the oldest freestanding bars in Las Vegas and one of our favorite stops during our Downtown Las Vegas bar crawl. Their seasonal menus offer a refreshing take on the current season, but one drink that is available year-round is the F-Bomb. Made with Fireball, Fernet and Atomic’s own energy drink, this beverage will wake you up and get you going. During your Downtown Las Vegas pub crawl with Vegas Pub Crawler, visit all the things that make this area great. Book your tour today and get ready for an epic adventure with all your friends.